I used penne pasta for this dish but of course, you're welcome to use whole wheat penne. In fact, you can use any short pasta for this dish including farfalle, macaroni, ziti, shells, etc. The best part of the dish is the ricotta and sausage. 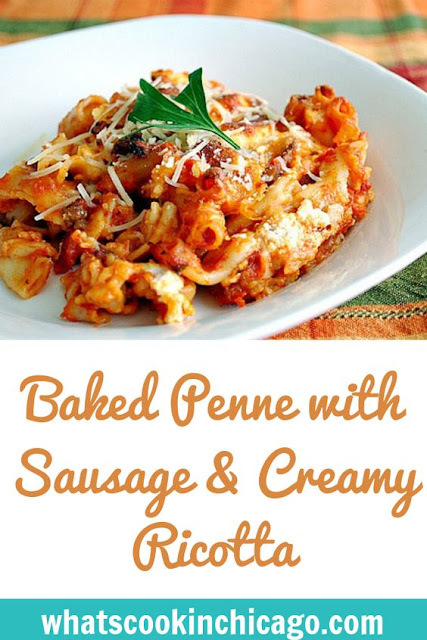 It really elevated the dish above the usual baked pasta casserole. The recipe yields just under 2 small springform pans that fit in my 6 quart IP; one we ate right away and one we froze for later. Press SAUTE and heat 1 tablespoon of the olive oil. Add the minced garlic and cook over moderate heat, stirring, until lightly browned, about 15-30 seconds. Add the sausage and cook, breaking up the meat, until browned, about 8 minutes. Add the tomato puree, water, sugar, bay leaf and fennel. Season with salt and pepper. Reserve 1 1/2 cups of the meat sauce. Add the cooked pasta to the remaining sauce in the IP. Toss to combine. Transfer pasta to a greased casserole dish or springform pan that fits inside your IP. Pour the reserved meat sauce over the pasta and dollop spoonfuls of the ricotta on top. Gently fold some of the ricotta into the pasta; don't overmix - you should have pockets of ricotta. Scatter the mozzarella on top and sprinkle with the Parmigiano-Reggiano. Cover casserole with foil. Clean out the now empty IP insert, dry and return to the IP base. Add 1 cup of water to the bottom and set trivet in place. Place foil covered casserole dish in IP and set on trivet. Meanwhile, preheat broiler if you want to brown the top of the casserole. Remove casserole dish and transfer to a baking sheet. Broil to your preferred doneness and allow dish to rest for 20 minutes before serving. 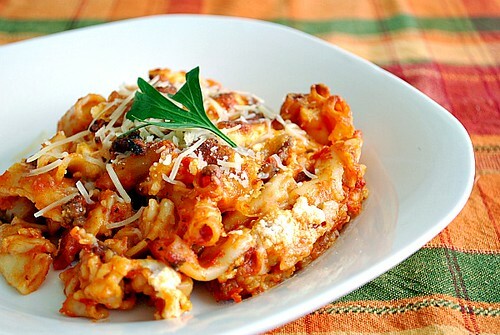 *Make Ahead/Freezer Meal: Prepare the recipe above but spoon the pasta into a freezer-container that fits into casserole dish you can place in your IP.Pour the remaining tomato sauce over the pasta and dollop large spoonfuls of the ricotta on top. Gently fold some of the ricotta into the pasta; don't overmix—you should have pockets of ricotta. Scatter the mozzarella on top and sprinkle with the Parmigiano-Reggiano. Cover and freeze. When ready to serve, transfer the pasta into a casserole dish that fits your IP and defrost. Continue to pressure cook as directed in the recipe above and broil afterwards if you want some color on top before serving. Let rest for 20 minutes before serving.